et des captations par hydrophone. Samedi 29 septembre, vers 12h, vous avez pu écouter Radio Beacon ! Dans le cadre de cette résidence, Euphonia a affrété pour l’occasion une yole, embarcation à voiles et avirons. Une récolte de sons sous-marins, des rencontres, des traces d’aventures qui sentent le chaud voire le roussi, c’est à une exploration sensible de la Méditerranée que Grit nous convie. Grèce, Italie, Malte, Marseille,… sa cartographie se dessine ici. « Pardon my French! I am German journalist and media artist working on my latest sound project in Marseille. At the studio I placed the most important gear for my 14 days of project work right next to mixing desk – LE MICRO ROBERT. Planning to learn at least one French word a day resulted in my first sentence yesterday: Madame, le riz est où ? So today, there will be risotto for dinner. Until then I will skip another day of sunshine in Marseille to work under the neon lights of Studio Euphonia, the ateliers-studio of Radio Grenouille and the place where, among other things, residents of Prix Phonurgia Nova are provided with room and support to work on their projects. And those are highly appreciated, as I spent the last six weeks on the road and on the Mediterranean Sea, moving constantly and recording non-stop, taking acoustic water samples. My new partner always at hand: a JrF D-series hydrophone. We had a wild trip. We listened to dolphins that really got wild in echolocating my partner, established a refugee radio station at the home island of Greek author Homer. We climbed on slippery and razor-sharp cliffs, recorded at dangerous heights and in positions that both my equipment insurance and grandmother must never hear about. While at sea, we had to evacuate the venerable wooden sailing ship I was recording on, because the diesel engine caught fire. Lesson learned: If you find yourself on a boat, always have a plastic zip-loc bag with your most precious and important equipment ready: a water bottle, sunscreen and shoes. Maybe you will walk on land again, but it might be hot like a barbecue grill, because it is a very hot summer at the Mediterranean Sea. While both my feet and recording equipment were recovering I started my work at Euphonia by auditioning all those adventures. 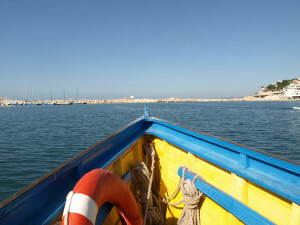 I find myself returning to the questions that led me to this project: I am listening to the Mediterranean Sea. What stories does it tell? Especially in the year 2018? The noise of the ocean is a chaotic sound. 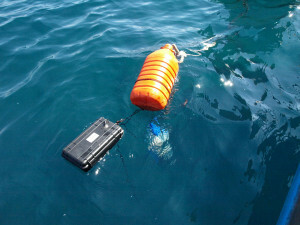 It is an acoustic network that contains the sum of all the ocean’s acoustic events and the information they contain. It is like a ball of wool in which human made sounds, the biosphere, life over and under water are weaved together. Until the end of September, I will continue scanning through my acoustic water samples, talking to acoustic researchers and marine scientists researching the Mediterranean to verify my results. 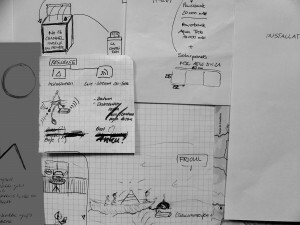 I will also work on a swimming installation that I call Radio Beacon. 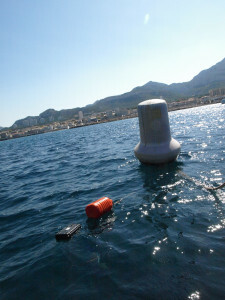 It works as radio transmitter, broadcasting some of the outrageous sounds I was listening to this summer, but also transmitting the underwater sound of the Mediterranean between Marseille and the island of Frioul. 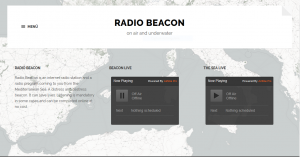 Radio Beacon will also tell some the stories as they happened this summer in the Mediterranean. Make yourself comfortable; your under water live stream is starting soon. Merci pour leur soutien au LFO, FabLab de Resonance Numérique et Zinc et au laboratoire de recherche Locus Sonus. 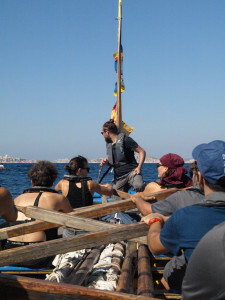 Thanks to : les Zou Maïennes et Zou Maiens, Anthony et Eric of FabLab, The crew of Radio Grenouille, and all people of Marseille that I was lucky to meet….et à Manu de l’ASPTT Pointe Rouge pour avoir retrouvé le matériel.